Dr. Woody English addresses the group at the recent board appreciation event. The history of Housecall Providers (HCP) has been shaped by a series of passionate and visionary individuals who have served on our Board of Directors. 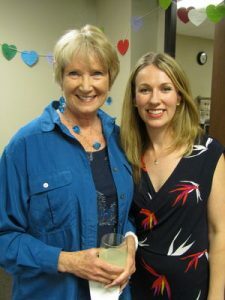 Those individuals were honored recently at a celebration hosted by staff to recognize their indispensable contributions, celebrate HCP’s bright future, and express our sincere appreciation for their leadership and service. 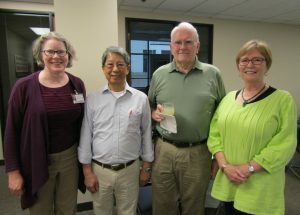 Those who attended represented a wide swath of HCP history, from the earliest days of the organization, when meetings were held in the basement of Multnomah County’s offices, to the most recent class of directors. First to address the group was former Executive Director, now Executive Advisor Terri Hobbs, who over the last 16 years witnessed firsthand the commitment of those in the room to the homebound members of our community. Founder and former Medical Director of Housecall Providers Dr. Benneth Husted gave a brief history of HCP’s development, beginning with her personal calling to deliver medical house calls to frail elders and concluding with another vote of confidence in the capacity of our new partnership with CareOregon to continue the mission of HCP well into the future. (l) Kathy Jones and Annette Kendall were both members of the recent Board of Directors. “We couldn’t have selected a better community partner to help us expand and enhance home-based medicine,” Dr. Husted stated. 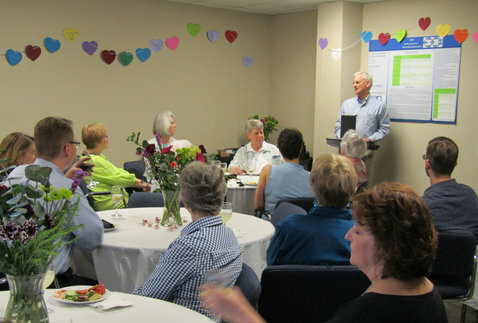 Dr. Will Kennedy, CareOregon’s senior medical director for clinical operations, also spoke at the event noting his appreciation for the service of the members of our Board as well as his hopes for the future. He specifically reflected on CareOregon’s role as a convener, adept at bringing diverse groups together to create innovative solutions. He also outlined his plans for future developments at HCP, including a focus on team building and the expansion of our innovative in-home palliative care program. After much reflection on the past and the future, the event concluded with attendees receiving awards and certificates in appreciation for their community service. As Housecall Providers continues to move forward, evolving to meet the ever-changing needs of our community, we gratefully do so from the solid foundation of service and leadership laid by our organization’s Board of Directors.